28 months later, and the world has never needed Jessica Jones more. Marvel’s Netflix drama is finally making its long-awaited return at a crucial moment when the very predators she exposes are being dragged into the light. There’s good reason Jessica Jones remains the pinnacle of Marvel’s streaming franchise, owing to its incredibly resonant focus on abuse and survival over costumed ninja fights. 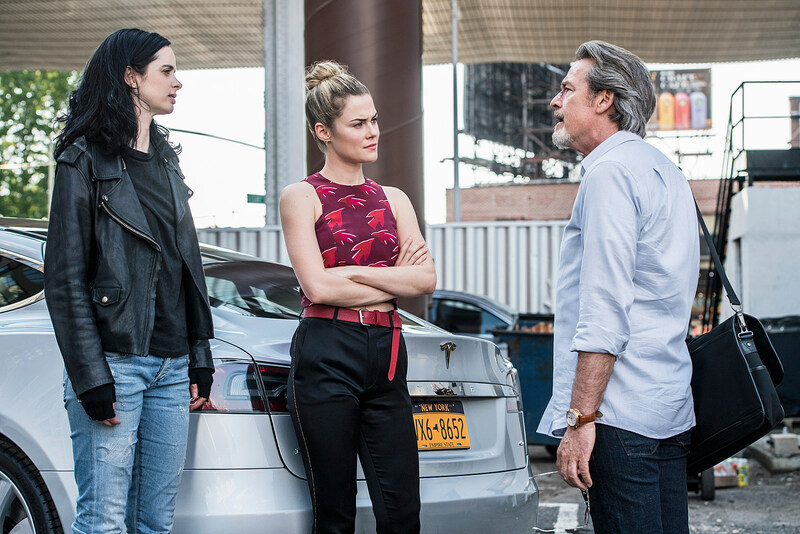 An indeterminate amount of time after The Defenders and the neck-snapping climax of Season 1, Jessica remains very much on the super-powered P.I. beat – albeit now plagued by her public reputation as a vigilante killer. Her friendship with adoptive sister Trish (Rachael Taylor) thrives, and even Alias Investigations seems somewhat on the upswing. Season 1 Big Bad Kilgrave is now little more than an unpleasant memory, but one question still nags at the Hell’s Kitchen heroine: Foggy records of the mysterious IGH imbuing her with superpowers all those years ago. The circumstances around her family’s death have now supplanted Kilgrave as the repressed memory haunting her each night. The toughest question Jessica Jones Season 2 has to answer is whether that mystery can support the absence of a central villain like Kilgrave, and, in the five episodes sent to critics, that does feel like a bit of a struggle. If Season 1 offered a super-powered Silence of the Lambs, Season 2 seems to try its hand at monster movie shtick* with an unseen killer picking off leads. It isn’t until Season 2 puts a face to the threat that things really start to pick up; having dragged a bit with minor nuisances like agency rivalry and building eviction, or a few repetitive arcs for the supporting cast. 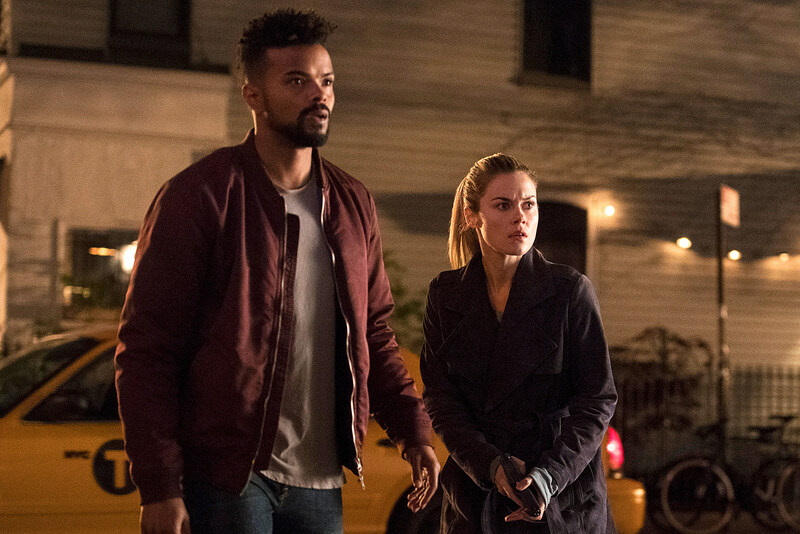 Trish is once again craving superheroism and locked in a bitter relationship with her mother (Rebecca De Mornay); Malcolm (Eka Darville) is once again looking for direction or respect, and Jeri Hogarth (Carrie-Anne Moss) discovers an unscrupulous means to use one of Jessica’s clients for her own ends. *An early action sequence even unfolds on a spooky abandoned movie set – way too much Scream 3 for my tastes. As far as newbies, this year sees Arrow alum J.R. Ramirez joining the cast as Jessica’s hunky new building super, an ex-con and family man distrustful of his super-powered tenant. There’s also House of Cards alum Terry Chen as a cocksure rival investigator and Twilight alum Leah Gibson as a streetwise woman pulled into Jessica’s investigation. And in the (temporary) absence of David Tennant’s Kilgrave, we have The White Queen’s Janet McTeer in an as-yet-unnamed role with an as-yet-unspecified connection to Jessica’s past. McTeer is terrifically charismatic and imposing (think the Incredible Hulk in Bellatrix Lestrange’s body), even as the second season spins its wheels a bit before we learn anything significant about her. Partly to blame for Season 2’s initial drag is that Jessica Jones’ first year had the benefit of introducing us to Luke Cage in its slow build toward The Defenders. Absent any indication of how or when Marvel might next combine its Netflix heroes, the spotlight shines a bit more harshly on Jessica Jones Season 2 returning to character beats the first season already covered. Her major torment this year – especially after Kilgrave’s demise – is whether her violent impulses make her every bit the monster people tend to see her as, or if IGH’s experiments are partly to blame. Season 2 starts to open up when the story plays with that idea, sending her to anger management or showcasing earnest attempts to avoid alienating those around her. In more than one instance, the opportunity for genuine romance is even on the table. All the same, Jessica Jones remains a series fundamentally told from the perspective of its women, whether by putting career before romance, super-power envy or protecting a professional legacy that peers dismiss as “pretty good for a girl.” The series’ sexuality remains firmly on its sleeve as well. Even without the bed-breaking antics of Season 1, there’s something to be said for the honesty of smash-cutting from grotesque cat calls to an interior bathroom stall. It’s that frank perspective that made the series so refreshing the first time around – one made all the more literal by Season 2 keeping the camera’s gaze exclusively female. The Marvel Netflix dramas have a well-documented tendency to slump during their back halves. Jessica Jones Season 2 has plenty going in the first five hours and ample time to bring it home, so I’m not going to sweat a bit of shiftlessness in the early episodes. There’s no one better-equipped to punch 2018 in the head, and Jessica famously always delivers on that front. I will say that one of the early episodes utilizes a delightful superpower not previously seen on any of the Netflix series. “With great power, comes great mental illness.” I will go to my grave questioning the use of this phrase in the MCU. Don’t expect too much in the way of Defenders references, but there is at least one unexpected (if logical) crossover. A certain fan-theory from Season 1 and the larger MCU may just come to fruition. Timely gun-control and predatory directors! This series was made for 2018.